Upon coming back from a backpacking trip, one of the first questions I receive is always whether I have met any bears. As the answer is generally positive, the follow-on question is whether I have any pictures. The response is negative most times for at least a couple of reasons: first, I do not own lenses long enough to safely photograph bears from a reasonable distance; and second, when I see a bear I play it safe and get the hell out of the area in a direction as different as possible from the bear's as I possibly can. But every rule has its exceptions, and over the years I have accumulated several shots of both black and brown bears. So here is a grizzly bear, with its characteristic blocky head, blunt face, and round hump between its shoulder blades. The grizzly bear (Ursus Arctos Horribilis) is a subspecies of North American brown bear that lives on the mainland (Alaska, Canada, and a few areas of the continental United States). Other subspecies are the Kodiak bear (Ursus Arctos Middendorffi) of Kodiak Island (Alaska), the peninsular grizzly (Ursus Arctos Gyas) of the Alaska peninsula, and the recently extinct California grizzly (Ursus Arctos Californicus) and Mexican grizzly bear (Ursus Arctos Nelsoni). Although the common name of "grizzly" comes from the golden and grey tips of the hair, its scientific one refers to its character. Brown bears are the biggest terrestrial predators on Earth, and although they share the digestive system and frontal vision with other carnivores, they are normally omnivores. Their diet varies enormously depending on the environment, but its majority is made of plants (berries, nuts, tubers, grasses). Small mammals (marmots, squirrels), fish (salmon, trout, clams), birds and their eggs, herbivores (caribou, deer, bighorn sheep), carrion, and insects complete their diets. They also prey on bigger mammals such as moose, bison, elk, and black bears, although this generally involves calves and weak individuals rather than healthy adults. However, no living creature is completely safe in their presence; I personally witnessed a huge grizzly in Denali National Park (Alaska) devouring a younger male that had intruded into its territory, a very rare case of cannibalism according to the park rangers. One of the things I enjoy most in life is backpacking and camping in the wilderness, and hence the presence of grizzlies greatly influences where I go, what I do, and the memories I bring back. I can not deny the danger grizzlies represent if planning to go into their territory. Although statistically small compared with virtually every other danger, one can not avoid thinking about it in the weeks before a trip. Grizzly bear attacks are so rare that, should one occur, you would have to shrug at the irony, curl into a ball, and hope to survive. The presence of grizzlies forces you to take precautions that make backpacking less enjoyable: food protection, camp placement, wind direction awareness, continuous yelling, and not letting your attention down for even a minute are not indeed the things that first come to your mind when you think about the perfect wilderness trip. Grizzly bears have more or less the same vision as humans, twice our hearing, and a sense of smell approximately 2100 times more sensitive. 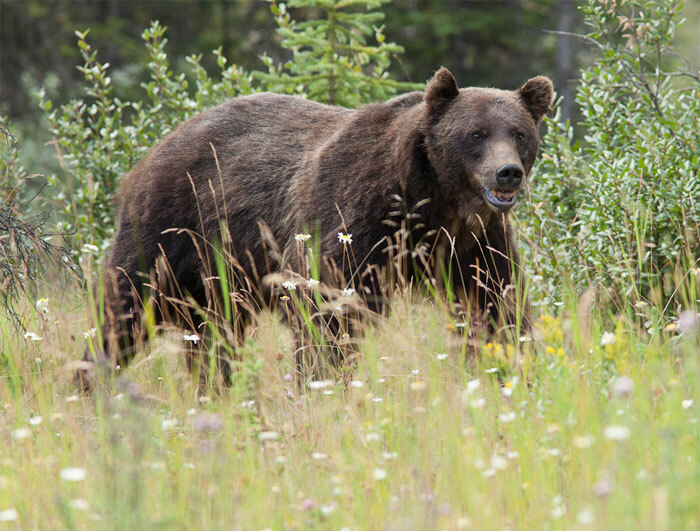 Coupled with their inquisitive nature (no danger in being curious when you are the biggest kid on the block) and quirky character, these simple facts dictate your conduct in grizzly country: do whatever it takes to never surprise a bear and to prevent it from getting your food. On the other side, there is a subtle but significant difference between a true wilderness (one with its complete ecosystem) and another where the top predator has been removed. They may look similar but they are not the same. And you notice the difference the very minute you set foot on a place where there may be a grizzly at the next turn of the trail, or behind that rock, that tree, or that ridge. You pay more attention, much more attention. Your eyes do not stop scanning the landscape and your ears do not stop listening. The result is that you see more and you hear more, and hence you experience more and enjoy yourself more. And when you get back to civilization you realize that those are precisely the reasons why you came to the wilderness in the first place. Until the time for the next backpacking trip gets closer and you start thinking about bears again.